The tides would be only about one-fourth of their current size (the Sun also causes tides with stretching and squeezing the Earth). In some scenarios for the origin of life in the primitive Earth, tidal effects caused by the Moon are important since they allow some environments to be alternatively wet and dry. This can favor chemical processes producing prebiotic molecules. In other words, by driving the tides, our lunar companion may have jump-started the life on Earth, or at least accelerated its progression. The giant impact that formed the moon most probably changed the Earth’s path around the sun. With this new object orbiting us, our gravitational pull the Sun exerts was also changed. Without that impact and the moon, we may not be in the same place in our orbit. Out planet might be out of the Goldilocks Zone Notes 1, meaning either it could be too hot or too cold. In a much colder planet, liquid water may never have flowed on the surface. And without liquid water to flow, life is nearly impossible to exist. On the flip side, we could be closer to the Sun, meaning higher temperatures, and thus the possibility of water being boiled away. Even if life could start, because of the powerful winds and extreme seasons, (see #2 and #3), it would be very different than today because of the extreme conditions on Earth. Some sort of life forms would exist capable of withstanding extreme temperatures, high winds, and short days. The smallest changes at the beginning of the evolutionary process can dramatically alter its course. Bacteria could easily adapt to these harsh conditions, of course, but complex life forms like humans – or even mammals would probably never evolve. If complex life could find a way to evolve, evolution might favor short, stumpy creatures. Because if they stood tall, they would struggle to bear the extreme winds. Plants would also be short with long roots. There would be no trees, no rainforests, and their biodiversity. The winds also would be very loud – so creatures would have to communicate in different ways, like changing colors of their skin of developing some sort of sign language. Ears would probably never evolve. They could also use the strong winds as a travel method. According to a new study, published by Rice University petrologists in the journal Science Advances, the planetary collision that formed the moon (also known as the “giant impact”, as mentioned above) made life possible on Earth. 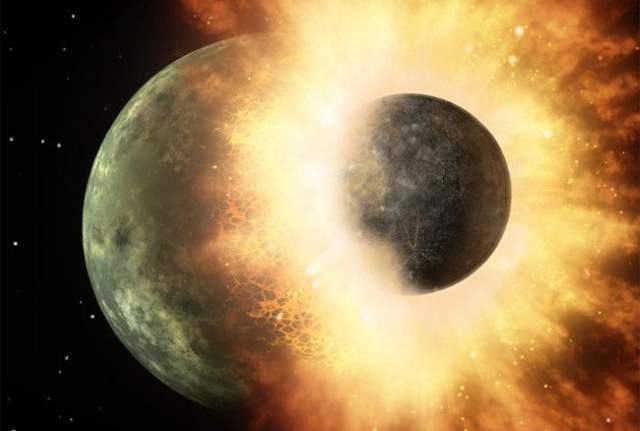 Scientists say the Earth most likely received the bulk of its carbon, nitrogen and other life-essential volatile elements from the planetary collision that created the moon. These are the essential elements that make life on Earth possible, and they are not native to Earth. In fact, in the beginning, all inner rocky planets in the inner solar system (Mercury, Venus, Earth, and Mars) were volatile-depleted. Scientists were thinking that these elements were delivered by the asteroid and comet impacts. But, there’s nearly twice as much carbon on Earth than there would be if these elements came from these objects. The researchers created a computer simulation that modeled the chaos of the early solar system and ran it around a billion times. They then looked through the results to see what could have caused the chemical ratios in Earth bulk silicate. The seasons exist because Earth’s axis is today tilted 23.5 degrees from the plane of its orbit around the sun. But this tilt changes. During a cycle that averages about 40,000 years, the tilt of the axis varies between 22.1 and 24.5 degrees. Because this tilt changes, the seasons as we know them can become exaggerated. More tilt means more severe seasons-warmer summers and colder winters; less tilt means less severe seasons-cooler summers and milder winters. For half of the Earth tilted towards the Sun, one hemisphere receives more solar radiation from the Sun than the other. In the image above, it’s summer in the southern hemisphere, while it’s winter in the northern hemisphere. The tilt of our planet’s axis would vary over time dramatically without a moon. This could create some very extreme seasons and weather conditions. Thanks to our Moon, the tilt of the axis is very stable – it only varies between 22.1 and 24.5 degrees during a cycle that averages about 40,000 years. Currently, it is 23.5 degrees. As the tilt of our planet’s axis varies wildly, the poles wouldn’t always be cold and the equator might not always be warm. Without our Moon to stabilize us, ice ages would preferentially hit different parts of our world every few thousand years. Why the axis of Earth would vary without the moon? You can watch the video below to find out. Some experts estimate that Jupiter could help keep Earth’s tilt from reeling completely out of control. Letꞌs say that one day in its orbit the Earth’s axis just happens to point away from the sun, and Jupiter is hanging out in that direction at the same time. And let’s say that happens again … and again … and again. Every time Earth’s axis and Jupiter line up, it gets a super-tiny gravitational pull. At first it’s nothing. But over millions of years it can add up. Before you know it, the accumulation of tugs has flipped the Earth over. When the moon was formed, the length of an average Earth day was just 6 hours. Moon slows down the rotation of Earth – and in around 4.5 billion years, now a day is 24 hours long. If the days were still six-hour-long, powerful winds up to 200 mph (322 km/h) would be a norm as a result of the rapid rotation of our planet. Without a moon, nights would be much darker. The full moon is around 14,000 times brighter than Venus, which is the next closest planetary body to Earth after the moon. This could be a good thing for astronomers as the stargazing would be spectacular, but, unfortunately, there would be no astronomers to take advantage of these dark skies as the complex life forms like humans could probably never evolve. What would happen if Moon suddenly disappears? As mentioned above, the moon has the largest influence on Earth’s tides. Without it, high and low tides would shrink by an estimated 75%. This would jeopardize the lives of many types of crabs, mussels, and sea snails that live in tidal zones and disrupt the diets of larger animals who rely on them for food, threatening entire coastal ecosystems in the process. Within a few decades, we would start to see mass population declines in the sea and on land – paving the way to great mass extinction. Furthermore, tides and tidal currents help mix cold arctic waters with warmer waters in the tropics. This balances temperatures and stabilizes the climate worldwide. Without the moon, weather forecasts would be practically impossible. The average difference between the hottest and coldest places on Earth could grow to life-threatening extremes. But none of this compares to the biggest change that we would have coming over the next millennia: the instability of the tilt of the Earth’s axis, as explained above. If the moon disappeared, Earth’s axis would wobble between anywhere from 10 to 45º. Even just an extra 10º tilt could wreak havoc on the climate and seasons: in the past, Earth’s tilt has changed by about 1-2º, which scientists think could have caused Ice Ages in the past. It’s hard to know what a 10º or 45º tilt would do but probably nothing good for most life on Earth. In a 2013 review in the Journal of Animal Ecology, researchers conducted a quantitative meta-analysis examining the effects of moonlight on the activity of 59 nocturnal mammal species. They found animals that use vision as their primary mode of interacting with the world benefit (survival-wise) from the moon’s presence. Many nocturnal predators, like tigers and lions, rely on the cover of darkness with just a bit of moonlight to hunt effectively. There also would be no eclipses (solar or lunar). Even if humans could evolve on a moonless Earth, there’d be no nearby world for astronauts to visit. We might never have begun to venture out into the solar system – we could lose our interest in space exploration completely. Our moon is on the move. Each year, it drifts an estimated 1.5 inches further away from Earth. And in the process, Earth’s rotation is actually slowing down. What if one night, the moon simply disappeared? Would we miss it? The Goldilocks principle is named by analogy to the children’s story, The Three Bears, in which a little girl named Goldilocks tastes three different bowls of porridge, and she finds that she prefers porridge which is neither too hot nor too cold, but has just the right temperature. The Goldilocks principle states that something must fall within certain margins, as opposed to reaching extremes. In planetary science, the “Goldilocks zone” is terminology for the the band around a sun where temperatures are neither too hot nor too cold for liquid water to exist. The size of the habitable zone clearly depends on the luminosity of the star, which determines the equilibrium temperature of the planet. However, modern models for the range of the habitable zone take into account more subtle effects, such as the effect of the carbonate-silicate cycle in regulating carbon dioxide in a planet’s atmosphere. Estimates for the habitable zone within the Solar System range from 0.38 to 10.0 astronomical units or AU (the distance between Earth and Sun, approximately 93 million miles or 150 million km). The average distance from the Sun of some major bodies within the various estimates of the habitable zone are: Mercury, 0.39 AU; Venus, 0.72 AU; Earth, 1.00 AU; Mars, 1.52 AU; Vesta, 2.36 AU; Ceres, 2.77 AU.